This interim timetable will run until Sunday 28 July. Thereafter, a new schedule will be introduced, see our article here. Catastrophic flooding in and around the Elbe Valley earlier this month led to wholesale cancellations of train services to the west and south-west of Berlin. Passengers on those trains that did run had to endure major diversions and delays. The main railway line running west from Berlin was cut by flooding on 9 June and will take many weeks to restore. This is no ordinary rail route — it is Europe’s main east-west corridor for passenger trains. It normally carries sleek German ICEs linking Berlin with the major population centres of western Germany. 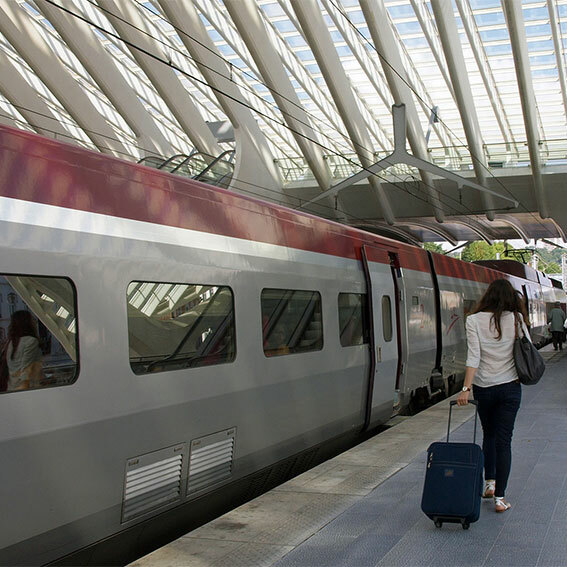 It is also used by the slightly less posh InterCity services to Amsterdam and many other international trains — Prague to Copenhagen, Moscow to Paris and more. After a couple of weeks of uncertainty and wholesale disruption, on 21 June the Deutsche Bahn (DB) introduced an interim timetable, which applies until at least 19 July. But don’t be surprised if it takes rather longer for full services on these key routes to be restored. For most journeys until 19 July (but not beyond) the revised timings are now live in DB’s Hafas timetable information system. Here are some key points to note in the emergency timetable. We refer below to tables in the Thomas Cook European Rail Timetable as ‘ERT’ followed by the two or three digit table number. This service, normally running six times per day between Berlin and Amsterdam, is almost totally suspended between Berlin and Hannover. There remains just one daytime train per week on this route: a Sunday afternoon journey from Berlin (IC 140). The Jan Kiepura night train from Berlin to Amsterdam will continue to run most nights, generally departing from either Berlin Lichtenberg or Berlin Ostbahnhof at 23.37. Do check carefully, as the departure station varies in a most confusing manner. On certain days this service will run only to Utrecht, from where it is a short hop on domestic Dutch services on to Amsterdam Centraal. This service is diverted between Berlin and Hannover adding about an extra 60 minutes to the normal journey time. These core ICE routes linking Berlin with south-west Germany (with some through services to Switzerland) are now rerouted to avoid the worst area of flood damage west of Berlin. These normally left Berlin and travelled west via Wolfsburg, only turning south beyond the Harz Mountains. Under the interim timetable, they will now run via Weimar to western Germany. There are no scheduled stops along the journey within the former territory of the GDR. So for most trains that means a non-stop run from Berlin to Fulda. But it is substantially slower than the regular route. The Frankfurt-Sprinter business service is restored from today and will now take that route south through Thuringia, with a non-stop run from Berlin to Frankfurt-am-Main. Despite the lack of intermediate stops, journey times are much extended. For the reason, the normal €15 Sprinter supplement will not apply. The InterCity services that ran from Berlin to Frankfurt (and beyond) via the fast line through Wolfsburg do not feature in the interim timetable. They are all cancelled from Berlin (but some will run from Hannover to Frankfurt). A service of about fifteen ICE trains per day has now been restored on the major axis across northern Germany. Unable to use the main line via Wolfsburg to Hannover, the trains are taking a very unusual route — one that evokes waves of nostalgia among diehard West Berliners who recall the days of the old transit corridor to West Germany. It certainly ain’t fast, but it is a route that brings back memories of the days when West Berlin was a western enclave behind the Iron Curtain. In those days, trains from West Berlin ran west via Potsdam to the border at Helmstedt. And that’s the route currently being taken by ICE trains from Berlin to Düsseldorf and Köln. Four InterCity trains each day will also run west from Berlin using the old transit route, one terminating at Hannover and the others continuing to Köln, Düsseldorf or Norddeich Mole. In addition, there is one-daily InterCity service from Berlin to Hannover which will travel via Stendal and Wolfsburg, making a lengthy diversion between those two station to avoid the damaged Elbe bridge at Schönhausen. The one train (mornings out from from Berlin, evenings return) is there to serve the commuter trafiic betwee Berlin the VW Works at Wolfsburg. The EuroCity services from Wroclaw via Berlin to Lüneburg (ERT 58) are not running west of Berlin. This route is thus very much truncated. You can read more about it elsewhere in European Rail News. Night train services to and from Berlin have been restored, but remain very much subject to delays and major diversions. We have already mentioned the Amsterdam service above. The overnight service to Copenhagen (ERT 54) will operate to much the same pattern as the Amsterdam train, with the same confusing mix of departure stations from Berlin. Passengers joining the Russian Railways carriages from Moscow to Switzerland (always a service one hunts for in vain in German timetables but admirably shown in ERT 24) will find a similar pattern. All these journeys involve a diversionary route between Berlin and Hannover. The City Night Line trains from Berlin to München (ERT 851) and Zürich (ERT 54) are running pretty much as normal. The overnight service to Paris is diverted west of Berlin with substantially longer travel times. The Russian Railways (RZD) Trans-European Express, which provides the only direct daytime train from Berlin to Paris (ERT 24), is diverted between Berlin and Fulda, so will not serve Hannover. RZD tell us that they expect this diversion to continue until at least 26 July. We have noticed that while the times of German trains have been updated meticulously in the Hafas database, the same attention to detail is not evident with the trains run by foreign railway administrations. Travellers using RZD services in particular would be well advised to cross-check with other sources.